ANC seeks solutions to the recent violent outbreaks in the area. The ANC on Thursday rolled out its national Thuma Mina Campaign weekend in Jabavu, White City, following the eruption of violence in the area amid allegations of illicit and expired goods sold in spaza shops. 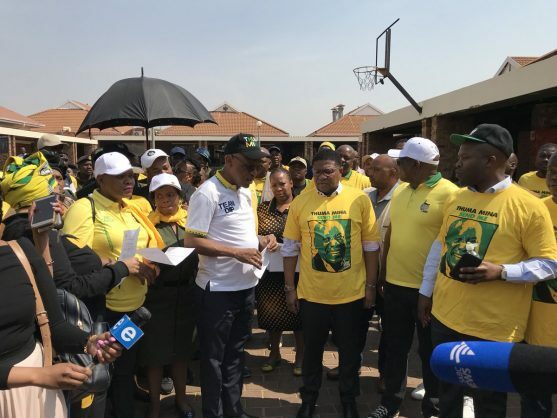 In a statement, the governing party said the campaign in Soweto, in partnership with local stakeholders, would seek to find solutions to the recent violent outbreaks in the area. A delegation of the party, which included national head of elections Fikile Mbalula, paid a visit to the families of those who lost their lives and those who were seriously injured during the eruption of violence. People were killed and injured following residents from White City going around looting and attacking shops owned by foreign nationals. The violence spread to other parts of the township and various shop owners then fled their neighbourhoods. In a video clip shared on his Twitter timeline, Mbalula told Sowetans gathered for the party’s campaign that for one to operate a spaza shop they must have a certificate of ownership and legal trading. The ANC’s head of elections said it is government’s responsibility to ensure that South Africans and foreign nationals legally trade and operate shops. Mbalula reiterated Health Minister Aaron Motsoaledi’s declaration that there’s no such thing as actual ‘fake goods’ but rather that there are expired goods. He said consumers should remain vigilante of expired goods and be empowered enough to take action in instances when they purchase such goods. Mbalula condemned the looting of shops owned by foreign nationals accused of selling expired or so-called ‘fake goods’. “You can’t loot a shop where you claim that people are selling illegal stuff because you are looting poison, you can’t do that,” Mbalula said. He said law enforcement agencies must conduct regular inspections at shops accused of selling goods that led to the outbreak in violence and looting. Mbalula said the ANC is committed to resuscitating the local economy primarily centred on spaza shops, adding that the nationality of a potential spaza owner is insignificant because what matters is that they adhere to the law when operating their business. Mbalula said President Cyril Ramaphosa would be in KwaZulu-Natal this weekend on the Thuma Mina campaign trail.